I recently ran off to Palm Spring for some mid-century immersion before the holidays! … and to see old friends, lounge in the sun and sample a variety of ice cold rose. First stop was the ADORABLE Holiday House Hotel – decorated by none other than the blue and white design guru, Mark D. Sykes. 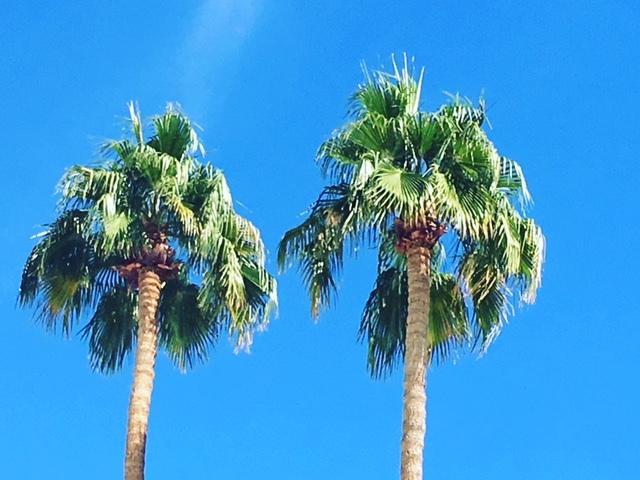 It looks so fresh in the desert against the bright sky and green palm trees. This is a little sitting area in the hotel. The wallpaper and couch fabric match, making the room feel so cozy. Italian Gio Ponti inspired tiles by the bar. More blue/white in this West Elm showhouse bedroom. West Elm took over an entire house in Palm Springs and decorated it head to toe with all of their mid-century modern wares. Another West Elm bedroom – they have great mid-century furniture at very accessible prices. Love these hanging West Elm globe lights and side tables. Artwork by local Palm Springs artists. Might have to get the little white pouf stool for my daughters new apartment! Next stop was a quick run through Kirk Douglas’ home. Kirk’s original bedroom tucked into the desert hill. A fun tennis statue in an outside seating area and my FAVORITE wallpaper in the powder room. This is the original wallpaper from the 1950’s. I want it! A fun photo that I snapped in his house. Look at young Michael Douglas in the upper left. Check out this crazy wall art my friend did in her Palm Springs house – it looks incredible! LOVE the mid-century madness in Palm Springs. My only purchase this year was a vintage lucite bracelet that I am obsessed with and wear almost everyday! Next week I will show you some of the Palm Springs exteriors that visited.